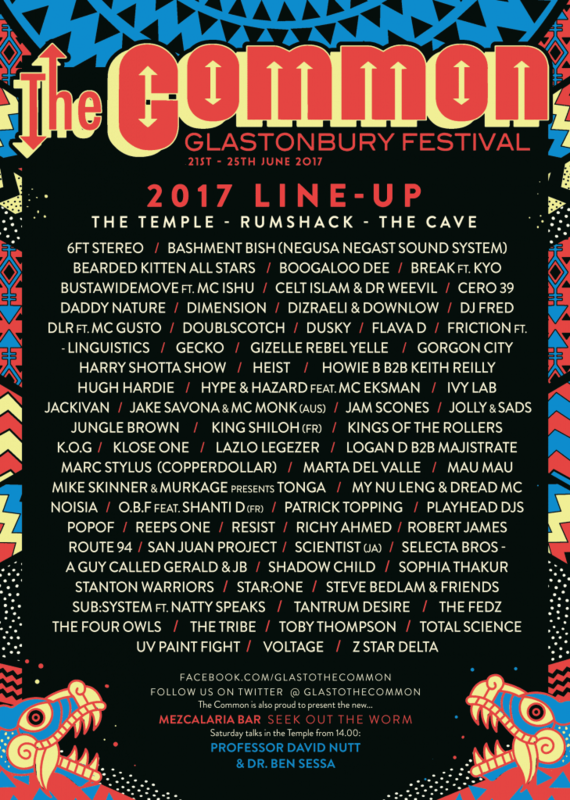 The Common line-up has been revealed today (May 19th, 2017) by Glastonbury Festival, featuring performances from Mike Skinner, Gorgon City and Noisia. The Common area is one of the many late night attractions, featuring venues such as The Temple, The Cave and The Rum Shack, which this year will double in size as part of an extensive revamp. The massive amphitheatre, known as The Temple, lives at the centre of the Common field and which is home to the annual Glastonbury tomato fight, will be larger and louder than ever this year as it undergoes a renovation. Fire, earth, water and the biggest, baddest rhythms! The Common is the place to get rooted, then rocket high on freedom. No-messing live music, top flight DJs, MCs on a mission, rituals, talks and a gigantic UV paint fight make this your original, organic Glastonbury experience. Everyone is welcome at the Cave, the buzzing Rum Shack and the immense Temple – this year, double the size! Wild line-ups in creative settings…Totems, symbols, colour, costume and dial-busting music. Just bring your smiles and be ready for dancing mayhem and the freshest sounds of NOW.